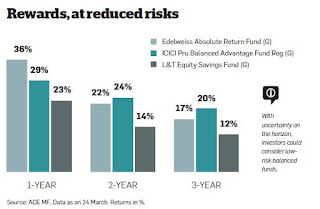 One fund which has absolutely floored me with its amazingly consistent performance in all types of market, especially in the last 8 quarters or so is the EDELWEISS ABSOLUTE RETURN FUND. I have ensured that every single client of mine has got an exposure to this fund. And, in fact, whatever maybe the Risk Profile of an Investor, this Fund is a MUST HAVE. Why am I so sold on this fund? Whats so special about this strange sounding Absolute Return fund. Edelweiss Absolute Return Fund may "sound" like a liquid fund because of the "absolute" in its name. But, its a Equity Fund and surprisingly its benchmark is Crisil MIP Blended Index Fund!. Edelweiss Absolute Return Fund is an ideal fund for those investors who want stable returns with low volatility. The Primary Objective of the Edelweiss Absolute Return Fund is to generate Absolute Return over a longer period of time without the accompanying volatility usually associated with Equity Funds. Special Situations, according to Edelweiss people, mean IPOs, Delistings, Equity Buy Back, Open Offers, Mergers, Acquisitions, etc. Special Situations aims at providing good trades which yield absolute returns over short periods. Its Special Situations has generated returns ranging from 3% to 25% Absolute Returns. The Fund also does not shy away from taking exposure to Money Market Instruments and IPOs too. Its hedging strategy is mostly dependent upon the basis of Corporate actions rather than on Market Valuations and this has helped the Fund in protecting the fall in NAV during market downsides. Since the fund's strategies of Equity Investment for Long Term, Special Situation Investments and, Hedging strategies and Derivative trading are not co-related, the volatility of the Fund drastically comes down. The fund has managed to beat its Benchmark quite consistently by a good margin and that too while taking less risks! The Edelweiss Absolute Return Fund has NOT given any negative returns if the investor has stayed for more than 2 years and upside is in line with Nifty! The Fund has participated in its stated objective of capturing 60% market upside and limiting to 20% of Nifty Downside splendidly. The Fact the Fund has been able to beat Nifty even during market upsides is clearly captured in the data shown alongside....whenever an investor has invested in Edelweiss Absolute Return Fund at the Lowest Level of Nifty, he has made more money in this Fund than Nifty. Its most unique and most attractive part is that when the Nifty/Sensex falls, the Fund's fall is closed to MIPs inspite of being an Equity Fund. Edelweiss Absolute Return Fund has been paying regular uninterrupted Quarterly dividend since the past 18 quarters. 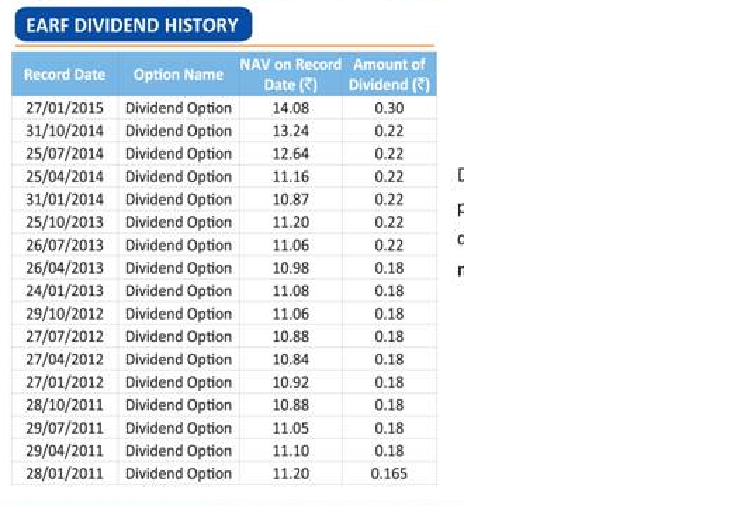 Its been paying about 2.2% which is eqvivalant to 8.8% Tax Free Dividend. And it even paid 3% dividend in Jan 2015. 1. This Fund is for those who want equity risk without the accompanying volatility. 2. The Fund is especially suitable for Investors who have a lumpsum in hand and are unsure of where to invest and could look at this fund as short to medium term alternative. 3. Good alternative to Fixed Deposits not only in terms of Returns but Taxation too. 4. New Investor to Equities who want to get a feel of Equity flavor. 5. An investor who is looking for consistent and stable return. Please treat this Fund as a MIP rather than a Equity or a Debt fund. If your time horizon is more than 18 months but less than 5 years, you should look at this fund. It is one of those rare funds which has given complete satisfaction to me and my clients both in Bull and Bear Periods. Especially their Prepaid SIP concept is something which every AMC should look at replicating. When a Fund not only protects you during downside but also participates in Upside, do you need to look at anything. If a client comes to me and wants only one fund it will be EDELWEISS ABSOLUTE RETURN FUND.